They will be wrong, whoever they are! … or they might be very wrong indeed. For example, in 1999, a large tribe of ‘excitable’ financial advisers (and fund sellers) were happily suggesting that the recent performance on the markets up to 1999 would continue for some time into the future. So, had you been a prospective investor at that time, you might have been told you’d be silly not to expect 10% p.a. (or more) on your money going forward. Indeed, one leading fund supermarket was aggressively promoting the Aberdeen Technology fund at that time and, not surprisingly, sold vast amounts of it. Well, that fund’s price had grown by nearly 200% in just 9 months from mid-1999. Yes, the fund price nearly trebled in just 9 months… and, incredibly, a lot of investors thought the growth might continue – such was the exuberance towards the end of the last millenium. Very few investors expected what was coming. So, the money piled in. Aberdeen took in more money in a week than they’ attracted in almost 20 years! … were, instead, hit by losses of nearly 90% over the following two years. … 19 years on from that rush of new money – the fund price is still only at about half of its peak value. 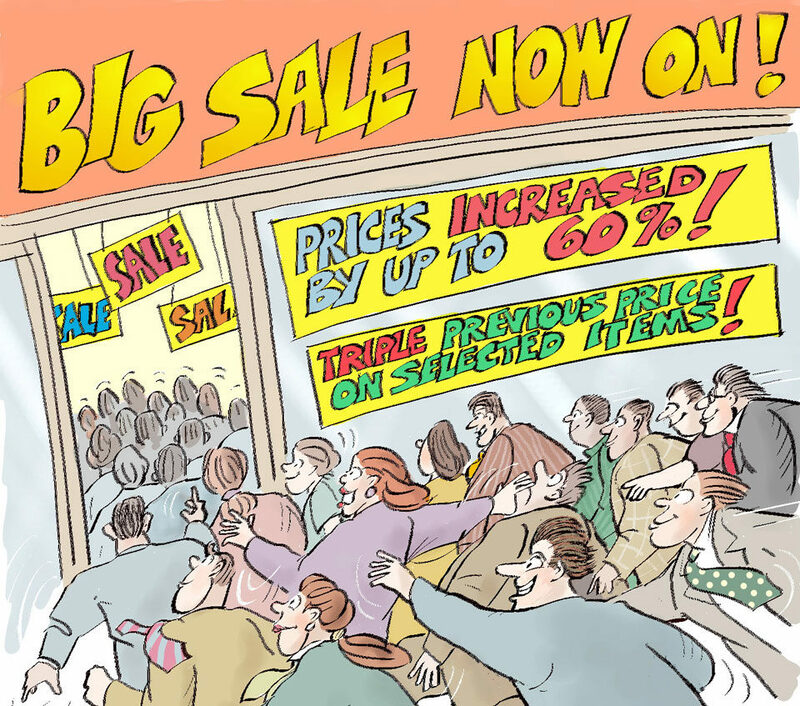 So, that’s ruddy painful for those who went in at the top, especially those who sold out at super low prices – as many did. But I’m not sure about that. People have short memories and they generally only look at the recent performance of funds to get a guide for their future predictions. Which, of course, is precisely the wrong thing to do. So, was this just a problem with technology funds? In 1999 even some of the most cautious and well-qualified advisers will have told you to expect future returns of 6% p.a. (over inflation) from a broadly based ‘whole of stock market’ type of fund. And they used that number of 6% p.a. because it’s what the world’s main stock markets have returned (in real terms) over the very long term. So, that’s over 100 years or so. 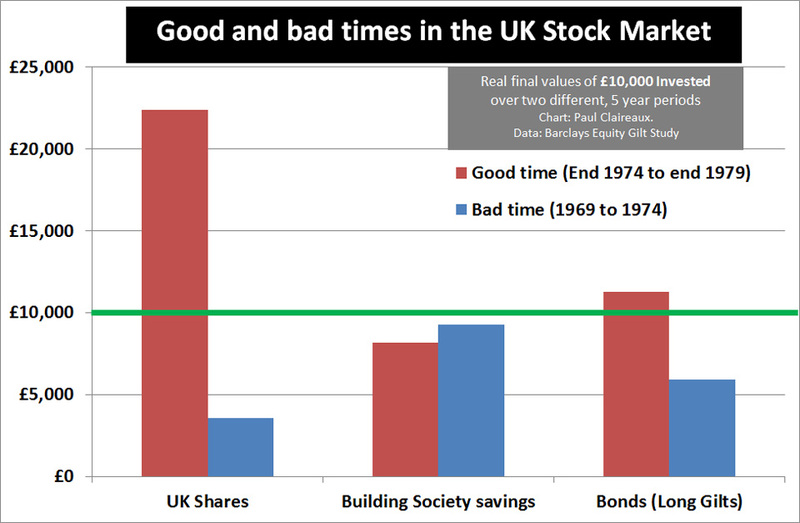 … stockmarkets simply don’t deliver this return consistently over shorter timescales. So, you need to look at what markets deliver over shorter timescales, over 10 or 15 year periods… or whatever the timescale you have for the life goal you want to fund. Sometimes markets deliver a lot more than 5% p.a. real. At other times they deliver a lot less than that. And sometimes, even over 5 year periods, they can deliver quite big losses – in real – iinflation-adjustedterms. In hindsight, most advisers will admit that it was silly to assume that markets would carry on delivering high – or even their ‘normal’ (very long term) returns from 1999. It was quite clear (on any accepted valuation measure) that the wider stock market had gone wild with that technology stock buying frenzy. … which meant that even the ‘broadly based’ Index Tracking funds became a lot riskier too. … they were then hit again in the global financial crisis of 2008-09. So, what return did they make over 10 years from 2000? Well, it was not the predicted +5% p.a. It was more like minus 5% p.a. as shown in that chart above. So, why do markets go crazy like this? 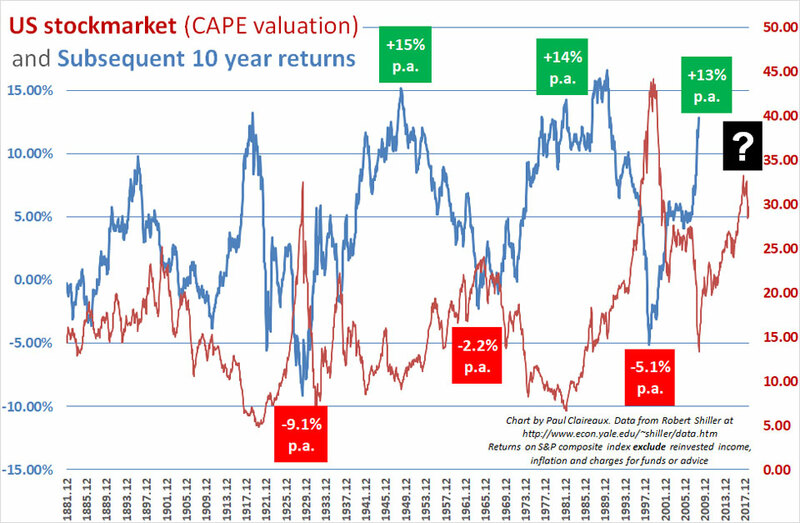 Why do they get pumped up to absurdly high valuations only to get smashed in the next crash. That’s actually a brilliant question and the academics argue a lot about it. Fans of the ‘efficient market’ ideas of Professor Eugene Fama believe that most of the variations in asset prices are determined by changes in risk appetite. are all the logical “automatons” – that orthodox economic theory assumes us to be. As the appetite for risk of investors generally increases, then they will buy risky assets at higher prices, despite knowing that their ‘expected’ returns will be lower than they would be if they’d bought at a low point. So, they accept those market risks for a lower expected return. That’s what having more appetite for risk is about. Likewise, when prices are low relative to earnings – it’s because investors have lost their appetite for risk. So, because they’re ‘rational’ 😉 they demand a high ‘expected’ return before they buy? and optimistic when prices are low. Professor Robert Shiller observes that what goes on in the real world is precisely the opposite of that idea above. His evidence is that investors are normally optimistic (bullish) at the top of the market and pessimistic at the bottom. So, they go into risky assets at high points with a naïve hope for a continuation of those high returns. And there’s more evidence to support Shiller’s view. In research by Robin Greenwood and Andrei Shleifer at Harvard (‘Expectations of returns and expected returns’, January 2013) we see that investor expectations are highly positively correlated with past stock returns and with the level of the stock market. In other words, we wrongly believe that past performance is a guide to future performance. And that’s in line with what ‘feels’ obvious anyway right? The truth is that in the universe of investors as a whole (Both retail – that’s you and me – and wholesale – the big insurance and investment funds) there are players on both sides of this behavioural equation. 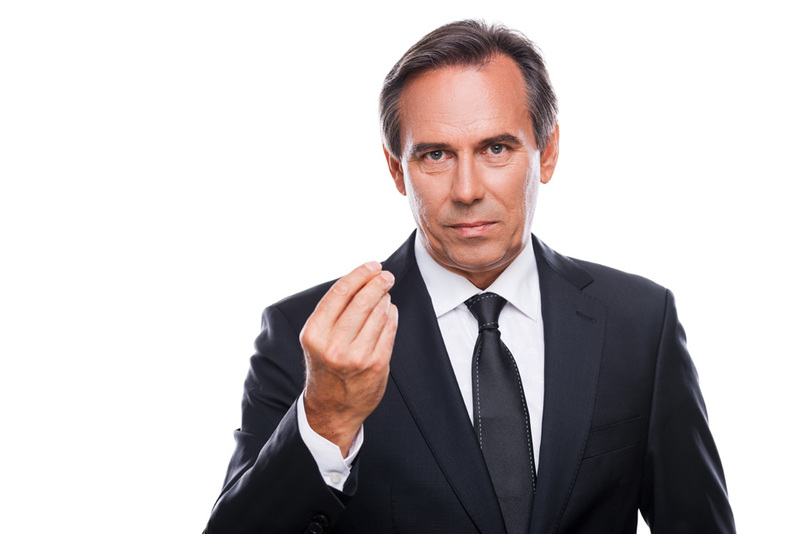 Some are acting as Shiller suggests – in an emotional way and getting over excited about high markets – and overly depressed about them when they fall. On the other hand, I have no doubt that some professional investors do indeed expect a low return on their money from this point. They know what the yields are and can work that out. It’s just that they’re stuck as to where to invest given that their ‘risk-free’ alternatives (Cash deposits or Government bonds) are offering such horrendously low returns. markets are not true (free) markets now. Interest rates have been massively distorted by central bank interventions. So, what’s the easy and obvious explanation? All types of investors are driven by two things. And that includes those supposedly rational, calm and calculating professional investors – because they have to compete with other funds. So some fund managers will stay fully invested (up to the limits for their fund sector) for longer than they know is sensible – in order to avoid getting left behind in the performance tables. … which is precisely what happened to Tony Dye (one of the UK’s leading fund managers) in the late 1990s. So, when markets race up – all investors (individual and institutional) want a piece of the action. Because we all fear missing out. But when markets crash suddenly and fall to better value – we tend to want out for fear of taking further losses. 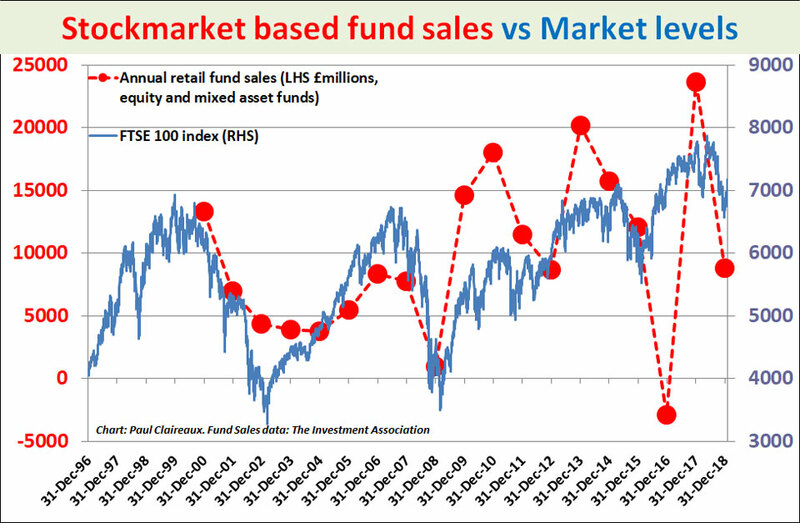 This chart – taken from my book, ‘Who misleads you about money?’ shows how fund sales go up after markets go up – and vice versa! This is the data behind that cartoon at the top of this page. People behave very differently when buying investments compared to other ‘stuff’. Which is quite clearly mad right? Well, I don’t offer investment advice. … because what’s right for you will depend on your personal circumstances. More on that here … but in short, a good financial plan must take into account your personal financial situation and your attitude and your capacity for investment risk – on each of your personal financial goals. And these things are all completely unique to you. If you use ‘actively managed’ funds (perhaps because you want some protection on the downside) make sure the funds you’re using are not ‘closet tracking’ funds. You need them to be different from tracking funds if they’re to behave differently. * You can also take existing funds and recycle them back into the market this way if that’s right for you personally. These are all matters to discuss with your adviser. Also, make sure that your adviser – or the investment expert behind them** has a view on market valuations that changes over time. ** And be aware that most financial planners are not responsible for the detailed investment of your underlying funds. That job is either done by the managers of the funds in which you’re invested or outsourced to a specialist discretionary fund manager. If there’s one fact about stock market investing you can rely on, it’s this. Stock-markets do NOT always offer great value.